All delivery times are subject to stock availability and are given in good faith. The company shall not be liable for delays caused by reasons beyond its control, such as adverse weather conditions illness, shortages, disputes or other such circumstances. Delivery will only be made to the address on the order unless a contrary intention appears on the order or delivery note. Delivery is deemed complete when goods are delivered to the buyers door or ground floor door of flat/apartment. No guarantee can be given that goods can be delivered into a property or specific room. All deliveries require a signature by the buyer or buyer representative. If your delivery is requested to be taken to room of choice, the buyer or buyers representatives acknowledge that such is done at the buyers own risk. No responsibility shall rest with this company or its delivery partners in respect of damage to decoration, ornaments or fixtures and fittings. Please ensure all access ways are clear. If the delivery team deem that there may be a risk of damage or a health and safety risk they may refuse to deliver to your desired location within the delivery address. Items such as mattress protectors will be delivered by post or carrier. Buyer should note that most goods delivered will require some form of self assembly including all bed frames, bunks, midi and high sleepers, children’s beds furniture and divan beds. Such goods will not be assembled by the company or its agents delivery partners or servants. We do not deliver to the Republic of Ireland, Northern Ireland and off shore islands including Isle of Man and Isle of Wight. The company and its delivery partners have the discretion to refuse the collection of any goods deemed to represent a health and safety risk. The company and its delivery partners do not have to satisfy themselves that the person signing for the delivery is authorised by the buyer. Buyers who agree an agreed delivery time and are not available or refuse a delivery at their door will be liable to a charge of £40.00 plus VAT. This service is available only to limited goods and is usually delivered within 7 - 10 days. These are limited to a number of goods as indicated. The buyer has an unconditional right to cancel an order. Buyers right to cancel means you must inform North Wales Beds no later than 7 working days from the day of delivery. 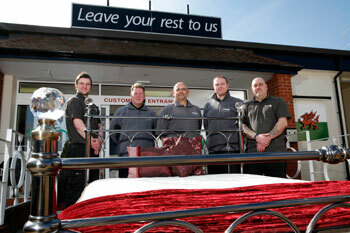 In writing or via email to info@northwalesbeds.co.uk. Made to measure special order goods (see definitions) cannot be cancelled once the order has been accepted by North Wales Beds. Buyers can open packaging to inspect goods after delivery but if they are then rejected the buyer must make sure that the goods are not used, are taken care of and in their original condition. Buyers must return the goods in original packaging, including all parts and instructions. Buyer has 14 days to return goods. It is buyers responsibility to return goods at buyers own cost. It is buyers responsibility to check goods properly at time of delivery. 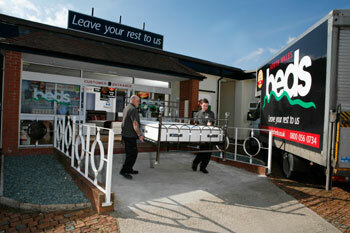 North Wales Beds reserve the right to check returned goods are fully complete as new and are acceptable for resale. If on inspection of returned goods, North Wales Beds find damage not due to company actions, North Wales Beds will seek to recover costs from the buyer. Refunds of returned goods will take place within 7 days of return of goods. Refunds will only be made onto the card that was used to make the original purchase. Unfortunately, no refunds will be allowed on any goods that have been slept on (unless goods are faulty). No refunds will be given for goods ordered by buyer in the wrong size. No refunds will be given for goods not fitting into the buyers bedroom, or due to access e.g. staircases, stairwells etc. All goods are guaranteed against faulty workmanship and materials for a minimum of 12 months from the date of delivery. Any guarantees or warranties over 12 months are provided by the manufacturers. All manufacturers warranties are limited, check terms and conditions. Manufacturers reserve the right to refuse service and void the warranty if the product is found to be stained, shows signs of damage accident or neglect. Make sure your mattress is never stained or soiled by using a proper mattress protector, make sure your warranty is valid, keep your invoice and warranty forms together to validate any claims. All guarantees are provided at the installation address only. Guarantees cease to operate if goods are transferred to an address outside the United Kingdom or if the goods are interfered with in any way. The guarantee/warranty is not transferable to any subsequent owner. Manufacturers reserve the right under their warranties or guarantees to have claims against their goods inspected by their personel or independent technician. This is to verify or repair a buyers claim. If no fault is found with the goods the buyer will have access to any reports completed by manufacturers representatives or inspection specialist. Any claims made after 12 months are subject to transfer costs. Charges will be applied to warranty claims after 12 months of delivery to the buyer. These charges are not standardised and may vary depending on the manufacturer. Buyer will be informed of any charges before a warranty claim is put into action by the company. Remember your contract is with North Wales Beds who will liaise with the said manufacturer and act on your claim if it is deemed genuine. Where manufacturers agree to replace goods no guarantee is given that a cover or colour match will be achieved.